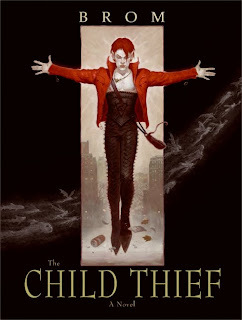 The acclaimed artist Brom brilliantly displays his multiple extraordinary talents in The Child Thief—a spellbinding re-imagining of the beloved Peter Pan story that carries readers through the perilous mist separating our world from the realm of Faerie. As Gregory Maguire did with his New York Times bestselling Wicked novels, Brom takes a classic children’s tale and turns it inside-out, painting a Neverland that, like Maguire’s Oz, is darker, richer, more complex than innocent world J.M. Barrie originally conceived. An ingeniously executed literary feat, illustrated with Brom’s sumptuous artwork, The Child Thief is contemporary fantasy at its finest—casting Peter Pan, the Lost Boys, even Captain Hook and his crew in a breathtaking new light. Peter is quick, daring, and full of mischief—and like all boys, he loves to play, though his games often end in blood. His eyes are sparkling gold, and when he graces you with his smile you are his friend for life. He appears to lonely, lost children—the broken, hopeless, and sexually abused—promising to take them to a secret place of great adventure, where magic is alive, and you never grow old. But his promised land is not Neverland. . . .
With this haunting, provocative, relentlessly thrilling reconsideration of a timeless children's classic, the acclaimed artist Brom dramatically displays another side of his extraordinary talent. Exploring the stygian blackness that gathers at the root of the beloved Peter Pan legend, he carries readers into a faerieland at once magically wondrous and deeply disturbing. Fourteen-year-old Nick would be lying dead in a Brooklyn park—murdered by drug dealers—had Peter not sprung out of the trees to save him. Now the irresistibly charismatic wild boy wants Nick to follow him into a strange and unsettling mist swirling around the bay. Even though he is wary of Peter's crazy talk of faeries and monsters, Nick agrees. After all, nowhere in New York City is safe for him now. And what more can he possibly lose? Accompanying Peter to a gray and ravished island that was once a lush, enchanted paradise, Nick finds himself unwittingly recruited for a war that has raged for centuries. He must learn to fight or die as he struggles to fit in with the "Devils"—Peter's savage tribe of lost and stolen children. Here, Peter's dark past is revealed: left to wolves as an infant, despised, tormented, and hunted, Peter moves between the worlds of faerie and man, struggling to understand what he is and where he belongs. The Child Thief is a leader of bloodthirsty children, a brave friend, and a creature driven to do whatever he must to kill the dreaded Captain and stop his murderous crew of "Flesh-eaters" before they blight every trace of magic left in this dying land. Beautifully illustrated by the author with haunting portraits and indelible images, Brom's The Child Thief is a daring novel of darkest contemporary fantasy that will, at once, haunt and exhilarate any reader who agrees to follow Peter on his desperate crusade. Eos is giving readers a chance to win original artwork from THE CHILD THIEF. To enter, fans can visit www.thechildthief.com or http://www.harpercollins.com/features/ChildThief/. I've heard of this. I thought it sounded pretty interesting too. I loved Disney's Peter Pan and a few other versions as well. It was just something about going off to a far away land--world, where there are no worries, just sounded fascinating! And the fact that's it darker, makes me more curious. Very good question...I'll have to ask the publicist and see if it was possibly a typo. This looks really, really interesting. My curiosity is very piqued by this book.